We created the art revolution. We are tired of the dead-white-guy canon. We are tired of the “classics” rotting on sterile museum walls. We’re about celebrating those who make our world beautiful now, those who time-machine themselves into their silent histories to create modern art on their own terms. 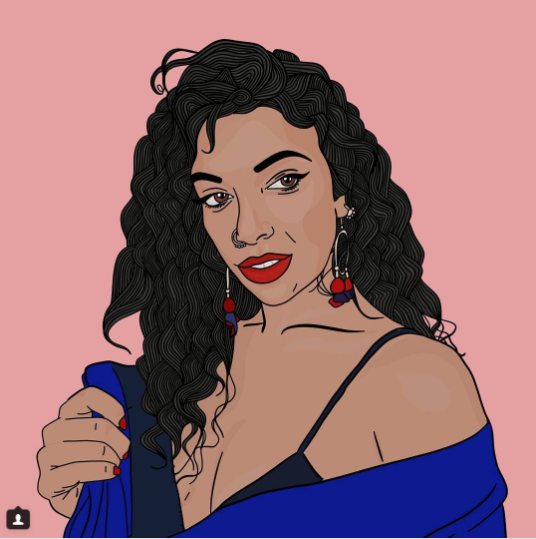 This month’s horoscopes celebrate the fine aesthetics of each zodiac sign and the South Asian artists who bring us these stunning, visual stories. On November 4th, we have a full moon in Taurus. On November 5th, Mercury enters Sagittarius and on November 7th, Venus enters Scorpio. Let’s take a breath together, now. Over three days, we have three powerful transits. Holy bohemian beauty. November is when we mimic the leaves. People wrap themselves in deep, psychic colors like burgundy, emerald green, and dark violet. With this particular triad of planetary transits, we are jumping into Poe’s infamous whirlpool in “A Descent into the Maelström,” wherein the main character falls, survives and comes out with markedly buffed character. We need adversity—there is beauty there, so much that some pain may escape us as we spin through our messy lives and come out as masterpieces. 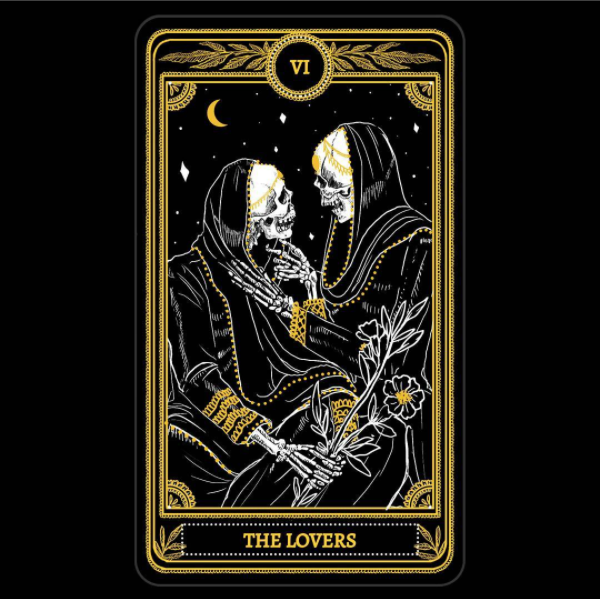 This is an art round up embedded in cosmological divination, so check out your Rising (how you show up), Moon (how you relate), Venus (how you love), and Mars (how you fight) signs in addition to your Sun (who you are) sign for the ultimate brew of arty satisfaction. 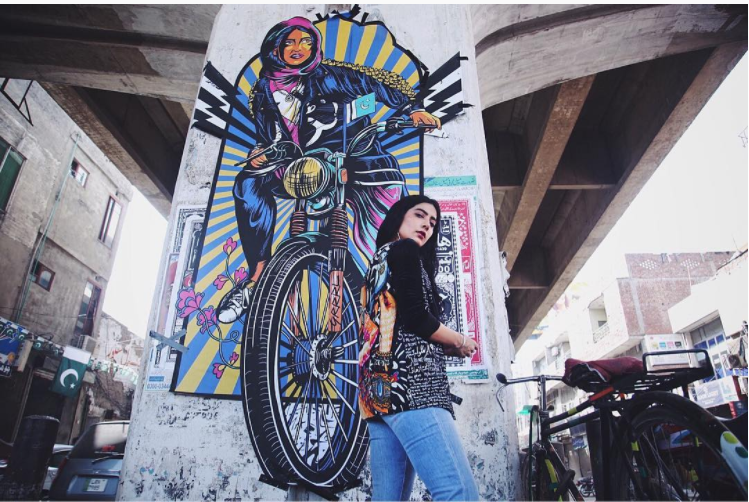 Fatemah Baig’s art is a technicolor parade. Somehow, Baig makes a 2-D scape look like a pop-up card. The sleeve on a lady in peacock print is skeumorphic: translucent, gossamer and clinging in space in spite of its flat aesthetic. You come across this way to people, Aries. Bold and clear, yet surprisingly faceted. Use this power of yours to manifest everything you want this month. The practical Taurus full moon is priming you to end the year with productivity. As an Aries, exalt the monotony by casting your spells in confidence. 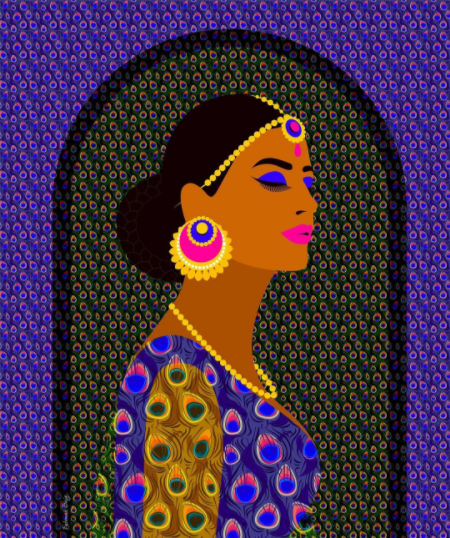 Jatinder Durhailay’s art is the perfect representation of everything the Taurus full moon will bring. It is no small thing when the moon fully expresses in your sign. 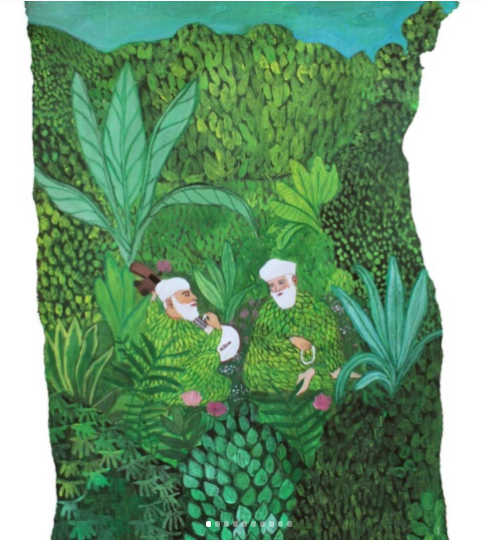 Durhailay’s work is versatile; its breadth is expansive and evolving: a woman offering yellow flowers, prophets in jungle canopies, shapes in abstract. It is delicate, bright, and spiritual. A Taurus can see the spiritual in the everyday—washing dishes, watering the gardenias, laying on a rough sofa. This month, you will rediscover your secure, committed attachment to yourself and your environment. Vijay Krish captures dualities outside of conventional binaries. There is more to two than polarity. There can be harmony in tugging. Gravity pushes a wheel until there’s a force to stop it. Circling can be fun and practical, and your audience is here for your acrobatics–somersaulting, cartwheeling, aerial gliding. Krish’s art ripples common perspectives about movement and space. 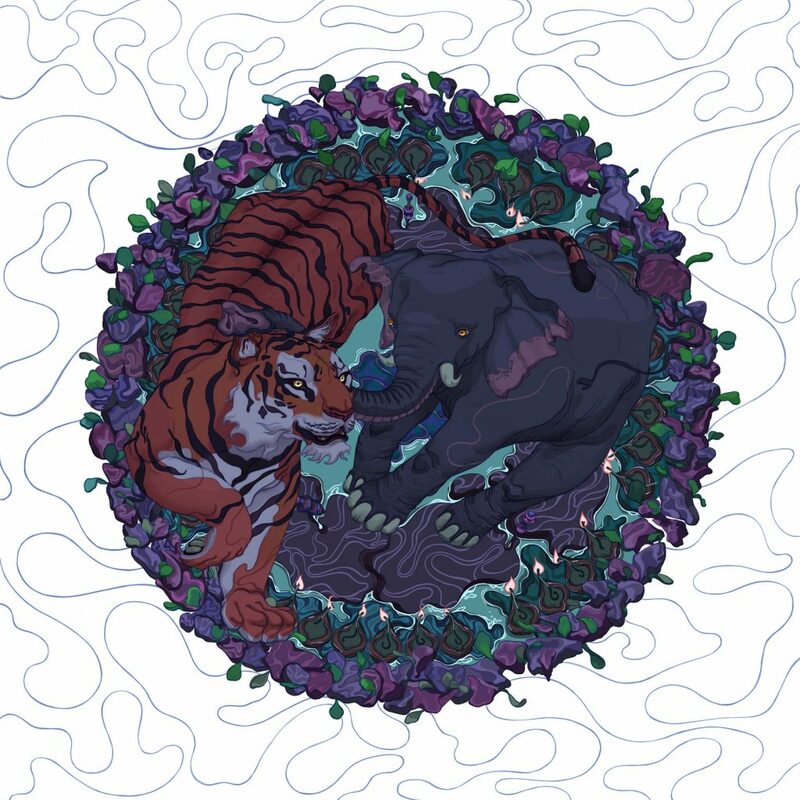 Like Krish’s tiger-and-elephant mandala, mimicking ying and yang, you have been teaching the world something: you can flex, stretch, and survey any feat you put your mind to. 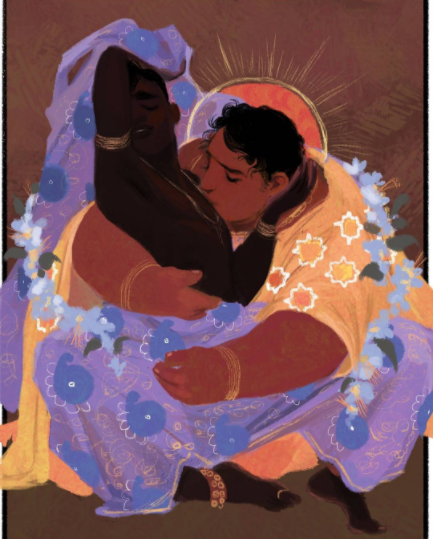 Akshay B. Varaham’s art is compassionate, warm, and refined. It profiles the majesty in simple love, the characters revealing the impression of a moment. It is radical in its inclusivity of figures who have and will always traverse the earth. Varaham’s art is an aperature to a world many Cancers know of but mainstream society is often kept from. This is history in art, unraveling into our modern days. It is careful, precise, and profound. You were born with this kind of energy, Cancer. Drape it on your sleeve. Dilraj Gahunia’s leviathan art belongs in a 3D feature film. It is heroic, glimmering, and holographic. You are thinking about empowerment, Leo. You are thinking about your rebellion, generosity and unconditional love. You are ready to express these traits under the influence of roaring Scorpio, artful Capricorn, and perceptive Sagittarius. There is something magical, unreachable, and comforting about you. 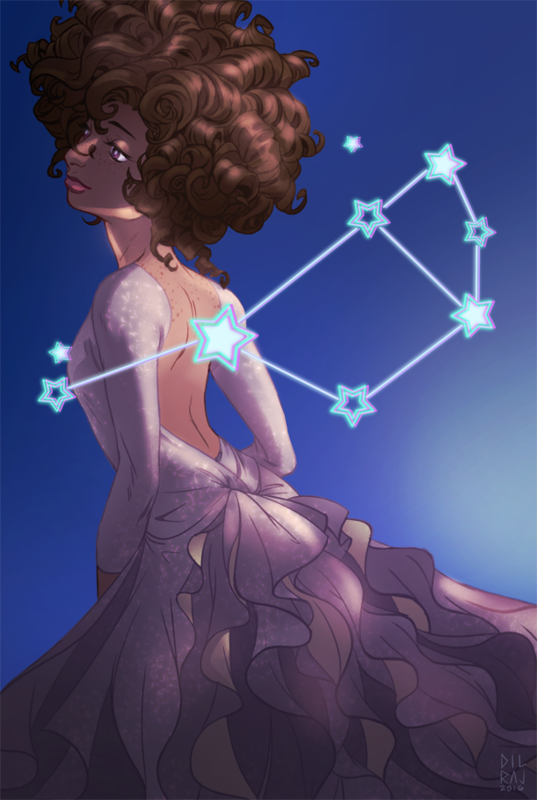 It’s almost like, anywhere you go, there’s a constellation floating around your body. No matter the sadness you may feel around this time, know that you are this powerful to someone. Amal Chughtai’s art is an effortless reveal of the beauty in every woman—particularly, those who are left out of mainstream narratives. The way our hairlines and follicles grow. The angle of our noses. The bows in our lips and our worn out collars. Like Taurus, you can sense the spirituality in the seemingly mediocre. Celebrate your beauty every day this month and until the end of the year—I mean, the eye-bags that come after a productive or mournful night, and how lovely that looks to passerbys. 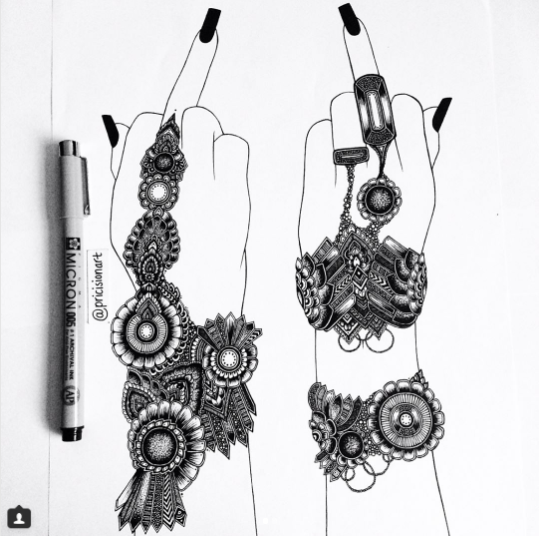 Prianka Bassi‘s work is ornate and well-practiced. It is an image of the neuronal connections in your brain. You work hard to make yourself, your possessions, your businesses, and the people around you beautiful. Everything you’ve been working on is consolidating into your life’s map. Take a step back and admire it. You are Scorpio’s neighbor sign, and have a knack for patterns and mastery. You’ve done your work, Libra. This end-of-year maelstrom is nothing. Cup your hands and open your heart strings. The universe wants to reward you. Amrit Brar’s illustrations are full of terror, story, and wisdom. She has command of a genre she has created entirely on her own. In person, she is bubbly and warm. A Scorpio is a beautiful creature with ruddy depth. Brar brings horror to the forefront of a culture where ghost stories are deeply embedded yet held just as sacred. She breaks the status quo and creates with complete integrity and authenticity. Scorpio, it’s time to lay the tracks down for what you think the world needs to handle. 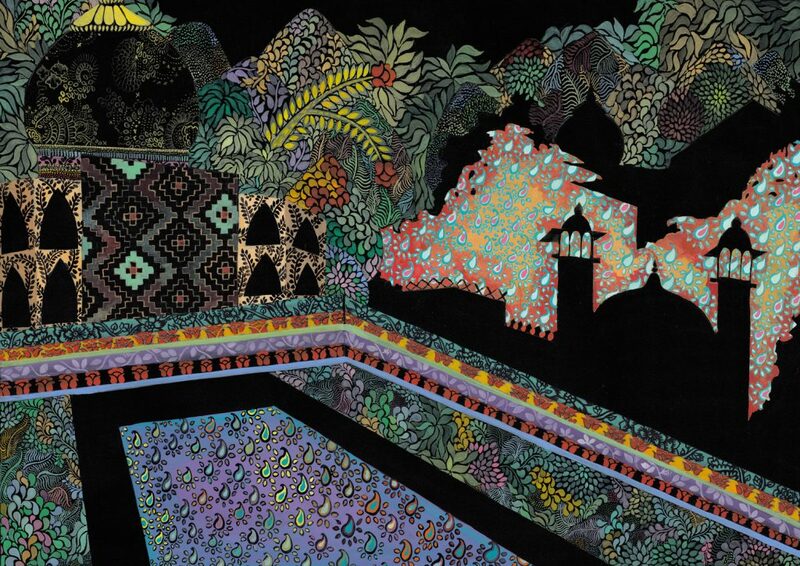 Marium Rana’s inky mosaics have a way of moving. You blink, a branch sways. Looking at it is an investment into the symbolisms of our lives. We see science, art, and the humanities. We see blueprints and our backyards. Who says you can’t rock in a nightclub and wake up the next morning to travel to a remote part of the earth? It’s a lifestyle people may not understand but that you have been living. As you reflect on the experiences you’ve gathered, take a moment to thank yourself and carry on. 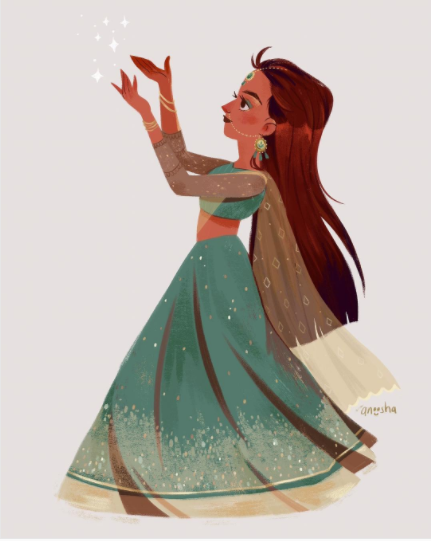 Shehzil Malik illustrates women for public spaces. These women take up space. They’re reading books about critical theory, scowling at a stranger, wading through racing thoughts, sitting in hijabs and boots. These are women as they already exist. They are not rare. They are all of us. There is connection here, a push and a pull, a noticing of people as they are and should be. You don’t need to wear a mask, Capricorn. Just show up. People will come towards you or pull away. Both acts are revealing. Hassan creates anime characters brown kids craved to see during their childhoods. Study drawings serve as visual notes for a finished piece. They are used to test rendering, plan compositions, and experiment with artistic elements. Often, they are just as, if not more, compelling than the finished piece. To be graced with this artist’s study is an honor. Aquarius, you are someone who honors and understands the journeys of others, and all the ways our psyches show up in the world. You can use your intuition to lead life in a safe way. 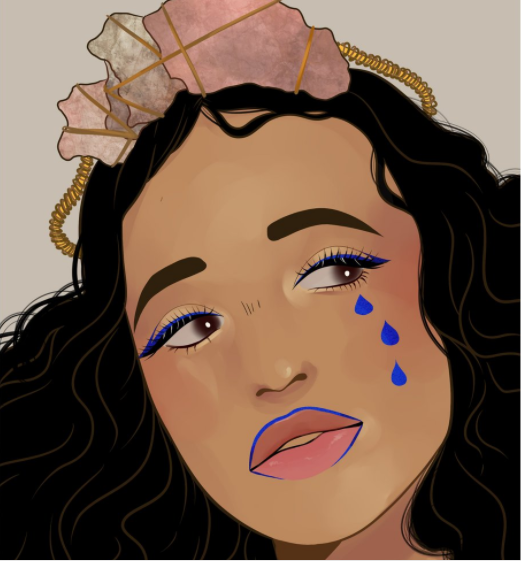 On Twitter, Anoosha Syed posted, “I never saw myself in cartoons as a kid, I want to change that!” Pisces, your eyes are a screen. For your whole life, you’ve been glued to them somehow. A beekeeper mask. A mosquito door. A mineral sifter. Maybe the TV. Probably the TV. Most likely the TV. Neptune rules film–it’s no wonder. Syed brings you the sweetie pies you always wanted to see yourself in. Talk to the child that lives in you. That child is still there, growing. Make it a daily practice.